If you want the plants in your garden to thrive, you need to invest in the best soil pH tester. Adding fertilizers to the soil is vital to keep your plants healthy and robust. But, often you do not know whether the soil has a sufficient amount of nutrients for the plants to flourish. And, there are people who dive into gardening and planting without any real knowledge about the soil. This can affect the growth of the plant. This is where a soil tester can help. A soil test kit helps you identify the nutrients you have to add that can raise the pH levels to normal. And, having a soil test kit handy can improve your gardening efforts dramatically. You can decide the acidity and alkalinity levels of the soil and the right amount of nitrogen, potassium, phosphorous and other nutrients you need to add to the soil. You will know which plants are absorbing the fertilizers you add and which are not. And, some soil testing kits also guide you on the amount of sunlight needed for the plants. Thus, with a soil testing kit, you can actually make your gardening efforts a big success, even if you are a newbie or do not have a green thumb. But, with so many models and brands available in the market, you are bound to be overwhelmed. To help you choose, we have come up with a list of the best soil test kit brands available. The list will help you decide the best test kit for your garden. Want to know a complete analysis of your soil just as professional landscape managers and agricultural producers do? The Soil Savvy Soil test kit is a professional grade soil test kit that is easy to use. A complete soil test report that comprises of soil pH analysis and 14 different nutrients, including nitrogen, phosphorus, potassium, and more. The kit comprises of all necessary tools for soil testing and a detailed instruction on how to use the kit. The soil pH test kit is just what you need if you are looking at a sustainable fertilizer management approach. You can keep your plants flourishing nice and good with the right amount of nutrients added to your soil. The comprehensive report you receive on the exact needs of the specific soil type you have is certainly a big advantage. It makes your gardening simpler and more satisfying than ever. 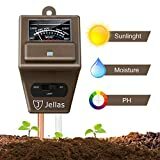 If you particular about the right sunlight, soil and water needs of your plants, buying the Jellas Soil pH meter may make a good shopping choice. This is a best soil pH meter that is designed as a three in one test kit that tests the moisture level, sunlight, and pH needs of your soil. With the kit, you will know the right amount of water, sunlight, and nutrients needed. You can adjust pH with the test result and a good feature in this test kit is it does not need batteries. Reads accurately the moisture range from a scale of 1 to 10 where the low level stands for dry, the medium range for normal and the higher range for wet soil. Measures relative light from a range of 0 to 2000 lux. The test kit is light in weight and easily portable hence can be used indoors and outdoors for the care of your plants, grass, and trees in your garden, farm, and lawn. 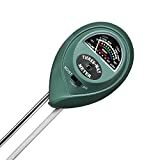 The meter is too large and can be used only for bigger plants and topples over when used for the smaller pots. Digital soil pH meter reviews are incomplete without featuring the Sonkir MSO2 pH meter review. 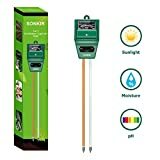 Sonkir Soil pH meter is a three in one kit that is ideal for testing pH value besides moisture and sunlight levels of your soil. Top quality detection technology with a double needle for enhanced accuracy and speed of detection and analysis of various essential aspects in plant care including moisture, pH and sunlight levels. It is easy to use. You have to just insert eh sensor probe inside soil, toggle the switch to test the sunlight, pH or moisture you need to measure and you get a reading in just a few minutes. In case of dry soil, the pointer does not swing indicating you need to water the plant. Is light in weight and hence can be easily used anywhere in your garden, indoor plants, farm or lawn. The light meter is useful mostly for indoor plants only. AKEfit soil pH meter is another 3 in on soil test kit that is designed to give you a complete report on the exact condition of your lawn and garden. This is the best home soil test kit as it is not only very effective in testing soil but also does not need an electric outlet or battery to function. The tool has three calibration tables in different colors to make it easy to view and read. The design is compact and can be used indoors and outdoors due to its high portability. 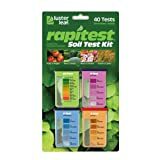 If you are looking for an affordable and effective soil testing kit, the Luster Leaf soil tester pack may be the right one for you. It is, in fact, the best way to test soil pH with its smart pH testing design. The test pack contains a total of 10 tests with four for testing pH and two testers each for testing Nitrogen, Phosphorous, and Potassium. The test kit consists of 5 test tubes with color codes. The results are determined by comparison of the colorimetric test results with the comparison chart provided. Digging up the dirt samples, adding capsule powder, mixing and waiting for the results is very cumbersome. When it comes to caring for plants in your garden it pays to know when to change the lighting, adjust the pH and water the plants. Failing in any one of these three aspects can affect your plants, lawn grass or vegetable garden. This is why you need an all in one soil testing kit like the Xlux soil tester. 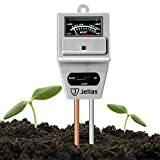 A three-way meter that you need to just plug into the soil you want to test and get the reading instantly. The readings for the moisture range from 1 indicating dry soil to 10 indicating moist soil. Light reading ranges from 0 which indicates low light to 2000 which denotes very intense light. The pH readings start from pH3.5 which indicates an acidic value to pH8 which indicates the basic nature of the soil. The product has 18 months warranty where the manufacturer takes care of the issues related to quality with refund or replacement. The soil test kit does not need batteries or electricity. It is portable and hence ideal for outdoor and indoor use. This is ideal for newbies and gardening enthusiasts as it prevents over or under watering of plants. Whether gardening is a hobby for you or you are into it full time, soil testing is an important part you cannot ignore. With a balanced pH, moisture, and lighting levels, your work of growing fruits, vegetables, plants and trees becomes easier. This is especially true when you have a hold all soil test kit for analyzing the soil like Jellas 3 in 1 soil pH meter. The toggle switch that helps you to find the exact pH, light and moisture level. The probe is plunged into the soil and when the toggle switch is used it gives you the present reading without the need for batteries. The moisture is indicated from a scale of 1 to 10, the light level is indicated by a range of 0 to 2000 lux and pH from 3.5 to 8 pH. The kit comes with a 45-day refund warranty and 18 months warranty period for fixing quality issues. The readings are not accurate. If you are looking for a budget soil test kit that is convenient and innovative at the same time, the Luster Leaf 1601 model is a good choice. 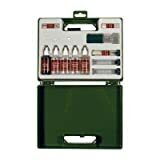 This lawn test kit pack includes home test kit for testing pH of soil, Potassium, Phosphorous, and Nitrogen. The kit includes all necessary components for 40 soil tests which comprise of 10 tests each for N, P, K pH. Contains patented color comparing system that helps compare any of the tests with the chart printed in specific color codes. The luster leaf is the best companion for a gardener as it helps identify the faults, amend and add the appropriate fertilizer for the soil. Thus healthy and flourishing plants are guaranteed with the kit. The vials are too light making them easy to topple when you empty or fill them. If you are looking for commercial grade moisture testing meter the General tools DSMM500 moisture meter probe may be an ideal choice for you. This soil analysis kit is designed to suit professional and agricultural use too. If you are in search of a professional grade soil testing kit for classroom or professional use, the Luster Leaf 1662 may be what you are looking for. The kit provides a good idea of the condition of your soil so that you give your plants the right soil mixture for an enhanced growth. The package features equipment and liquid testing reagents for a total of 40 tests. The tests include 10 soil pH tests, 10 each for testing Nitrogen, Potassium, and Phosphorus. The pack can be carried easily in the plastic carrying case, which also doubles up as a storage case. The kit is quite effective for plant hobbyists as well as regular home gardeners. With the kit, you can check soil efficiency many times during the important growing phase of plants. You need to go for a minimum of 4 inches depth into the ground to get an accurate reading. Soil testing kits are a significant addition to your gardening essentials if you want your garden, lawn, or farm to flourish. The big advantage with the soil testing kits is they are easy and simple to use. You can know what your plants need and make the adjustments so that they stay well-nourished during their growth phase. An ideal soil testing kit needs to have easy to understand instructions on how to use and store it when it is not in use. You also need to know how to calibrate it to arrive at the right solution. Of the various models listed above, you will find that all of them meet the basic criteria. If you want an affordable, multipurpose, and easy to use soil testing kit, then the three in one models are ideal for you. On the other hand, if you want to just check the soil pH level and P, K, N levels, then the Luster Leaf models are pretty efficient and come with good ratings. All the products in our list are from reliable gardening brands, so you can be assured of finding them meeting your soil testing needs admirably. We hope our review list clears all your doubts regarding the best soil testing kit so that you can easily decide the right testing kit for your garden and enjoy the results.